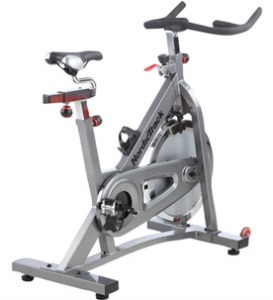 The NordicTrack GX2 Sport Bike is one of the best deals you can get for an entry-level spinning-type indoor cycle – if you can find it marked down 25% off its sale price of $399. This model has oversized steel frame, tension knob control, and a fairly quiet chain drive system. UPDATE: The GX2 has been discontinued and replaced by upgraded GX series models. 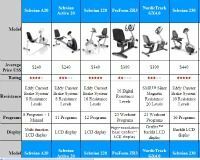 Check out the entire new sport exercise bike lineup on the NordicTrack site. The NordicTrack GX2 Sport Bike features dual-sided pedals with toe cages, adjustable non-slip handlebars, transport wheels, and a convenient water bottle holder. The seat is adjustable (up/down and fore/aft) but it feels hard and uncomfortable so you’ll want to spend extra to get a gel seat cover, or better still replace it with a better designed cycling saddle (about $60). 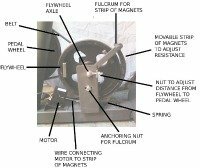 To increase resistance, turn the tension knob under the handlebars clockwise to increase tension on the flywheel and make pedaling more challenging. Turn the knob counterclockwise to decrease resistance. It takes only a small adjustment to work at a different tension level. The brake lever under the post will stop the flywheel completely. The parts warranty on the NordicTrack GX2 is too short so you might want to consider purchasing an extended warranty at checkout. Overall, user reviews have been positive on this model for its solid ride and construction. It is sturdy enough to support a max user weight of up to 250 pounds. While the NordicTrack GX2 Sport Bike at $399 is a nice choice for a bike for a casual rider who doesn’t need a better quality spin bike, we won’t recommend it until they bring the price down. The GX2 is the exact same frame and design as its cousin model, the Proform SPX 290 which sells for $299. The only difference is the paint job, and even there, the Proform black frame with red accents is snazzier than the all-gray NordicTrack. Both brands are made by ICON Fitness so you need to be a smart shopper to get the best value. By going with the Proform for $100 cheaper, you’ll also get free shipping and can use the money you save to buy a better saddle.